Blue and grey, whispers and black swirl above my head. 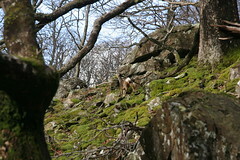 This is Borrowdale waiting for spring. Down in the valley brown and green are starting their change of watch. Of all the trees the Holly stands alone in it’s splendour of green and red, but not for much longer. Soon the skeletons of bark will burst to life in glorious foliage of every green hew..
Herdwick retain their fleeces, it’s too early to relinquish them. They’re ladies in waiting, foraging as they await the appropriate time. 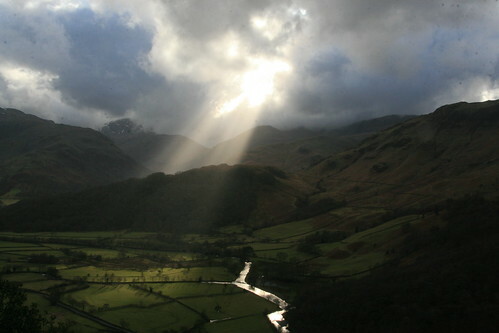 This is Borrowdale in February. A Kestel swoops low across the fells looking for food, he’s dressed in his showing off clothes making sure the ladies know where he is. The deer in the woods looks upon my stumbling attempts to climb the hills with a certain disdain then bounds off into the skeletons of bark. Great Gable and Scar Fell keep the remnants of the winter snow under a blanket of cold grey cloud. 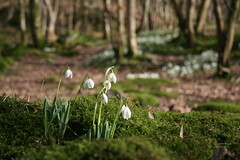 The snow drops in the valley below decorate the side of the river signalling the coming seasons. Then a twist of grey followed by a shift in the whispers and the glorious rays break through, spotlighting the valley floor and the river below. Above the river a heron glides leisurely above the florescent waters looking for a place to fish. Rods of light illuminating the droplets of rain left by the black. The rays are always there, but they aren’t the same without the rain to illuminate them. The sun is always present, but sometimes the clouds make it appear all the brighter.